Robustus is a high quality sliding door system for bi-passing doors with many applications including servery hatches, reception counters, cabinets and wardrobes. The tracks and channels are precision aluminium profiles in a silver anodised finish. The rollers have high load precision ball bearings and nylon tyres. The systems are available from stock and supplied in component form against individual specifications. 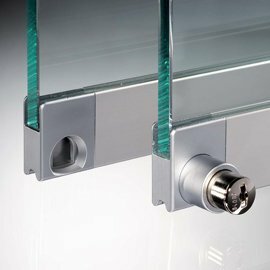 No notching or drilling of the glass is required. Please contact our sales office for more information.